Gourmet Favorites Cookie Gift Basket is filled up with some of our most popular Belgian Chocolate and Caramel Hand Dipped treats. Inside, they'll find a half dozen EACH of our tempting Belgian Chocolate Hand Dipped Pretzels, Klassic Krispies® Bites, Dipped & Decorated Oreos®, 2.5" Square Sugar Cookies, Decadent Triple Chocolate Brownie Bites, One Dozen Belgian Chocolate Foil Wrapped Oreos® (in assorted metallic foils), and 4 Hand Crafted Klassic Krispies® on Sticks. Our beautiful hand crafted Willow Basket measures 4" deep and 12" in diameter.All of the goodies are individually wrapped for freshness and quality,heat sealed and tightly shrink wrapped inside the basket, we finish each gift with a festive ribbon. 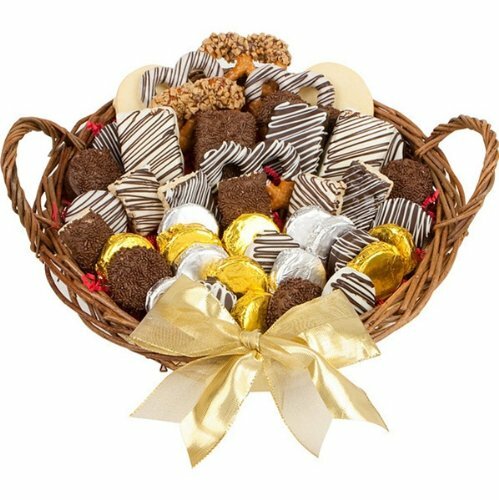 Favorites Gourmet Gift Basket is filled up with some of our most popular Belgian Chocolate and Caramel Hand Dipped treats. Inside, they'll find a half dozen EACH of our tempting Belgian Chocolate Hand Dipped Pretzels, Klassic Krispies® Bites, Dipped & Decorated Oreos®, 2.5" Square Sugar Cookies, Decadent Triple Chocolate Brownie Bites, One Dozen Belgian Chocolate Foil Wrapped Oreos® (in assorted metallic foils), and 4 Hand Crafted Klassic Krispies® on Sticks. Our beautiful hand crafted Willow Basket measures 4" deep and 12" in diameter.All of the goodies are individually wrapped for freshness and quality,heat sealed and tightly shrink wrapped inside the basket, we finish each gift with a festive ribbon.